How can Carnivores have been Plant eaters before the fall?? The Bible says that the earth is about 6,000yrs old and when God first created it, life, and the universe in 6 literal 24 hr days, it said there was no death and no need carnivores nor scavengers. The Bible, if it is to be believed even says that God gave fruits and vegetation to be the food of ALL animals, including man. However science, as it seems has come forward with proof how such an unlikelihood in our day, actually is a reality. For this we look at two of the most feared and vicious carnivores of our day. The Piranha fish and the alligator. Known for their sharp teeth, powerful jaws, and red bellies these fish of the South American Amazon river have a FEARED reputation of being able to kill just about any animal and strip flesh in schools. Piranhas have extremely sharp teeth that are designed for cutting. Natives use the jaws of dead, dried Piranhas to sharpen things like blow pipe darts, etc. Once they attack an animal, it has little chance of escaping because there are so many of these small fish and they eat the flesh in such a frenzy that they strip a small animal down to the bone within hours. A large animal may take a day, but when they're done there is little left but bones. A little known fact: They like the fruit that drops from the trees & eat fruit in most cases. But they will also not hesitate to eat anything living or dead, like other fish, each other, fallen baby birds, amphibians, snakes, lizards, or any mammal that ventures into the water, but will usually not attack unless the animal is bleeding, which creates a feeding frenzy. Despite their flesh-eating reputation, piranhas are omnivorous, eating more seeds than meat, and some even subsist on plants alone. They are most likely to eat meat when STARVED with no fruits nor vegetation available. A good example was Teddy Roosevelt, who caught them and put them in a tank without food, they tossed a dead cow into the river and released the fish, which naturally devoured the carcass. So it would seem these vicious carnivores only resort to eating meat if food from plant life is scarce or nonexistent. "I know piranhas eat meat but I recently found out that 4 out of 7 of my red bellied piranhas love to eat grapes, apples, dragon fruits, carrots, and especially durians. I been feeding them fruits for three days now and they all seem to be happy except for my other 2"
"A part of a Piranha's diet in the wild is fruit and seeds. They are opportunistic feeders, and will eat fruit." Crocodiles are often confused with alligators. 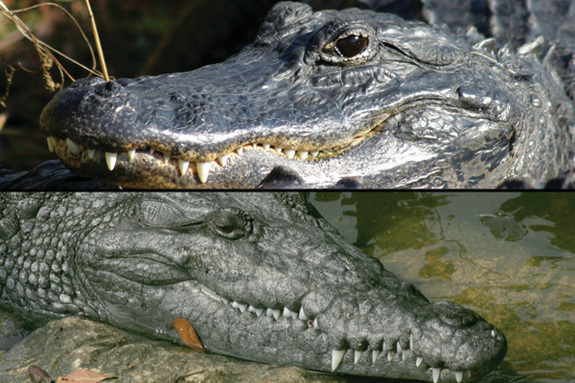 An alligator's jaw is U-shaped, while a crocodile has a V-shaped jaw, according to the San Diego Zoo. Both are known for their tremendous biting power. A crocodile's jaws can apply 5,000 pounds of pressure per square inch, compared to a human jaw's 100 pounds of pressure per square inch. However, the crocodile jaw has very little opening strength, though. For example, a crocodile's mouth can be held shut with a rubber band. Also neither can chew and once they crush their prey they swallow it whole. This brings us to the second most feared characteristic of these two reptiles, their rolls which they use once they clamp onto their prey, in an effort to tear off pieces they can swallow or drown their victims. These nutritional rewards plainly show that tho these reptiles are carnivores, that their original diet was originally meant to be fruit and vegetation, if fruits and vegetation are in abundance. The pre-fossil earth must have been lush with plant life in ABUNDANCE. For we find in the fossil record massive plant eating dinosaurs, the size of several large trucks or sometimes houses. And there wasn't just a handful Otherwise how can it support HERDS of plant eating dinosaurs that are behemoths and require the equal of several elephant's requirements worth vegetation each daily? Therefore the dinosaur world must have had an over abundance of plant life to easily feed herds of these giants. Surrounded with fruits and nuts to such an overwhelming degree would have turned all these carnivores (in truth omnivores) into herbivores, as it only depends what kind of food source is plentiful. But most important it shows God already knew from the very beginning that man would sin and bring death into the world, even before creating the earth. And being all knowing God had built in contingencies to clean up the dead carcasses that would result from death. This proves the Bible saying animals were all original herbivores to be 100% scientifically correct. 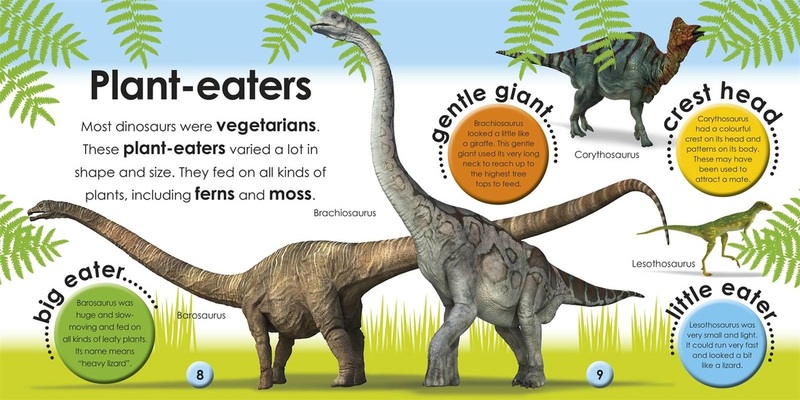 Ref: LiveSci-Dinos' Veggie Diets Packed Surprising Punch | DinoFacts-Apatosaurus / Brontosaurus | What plants did a brontosaurus eat? But what is more is this same Bible tells of God's original plan to deal with sin, when Adam and Eve made their choice to sin and bring death into this word. That plan was to send Jesus, who is God himself, into this world to live a perfect life in thoughts, motives, intents, and deeds and then take the punishment for the sins of everyone in the world on the cross. That way whoever believes on Jesus would be safe forevermore from the wrath God against all sin. If you'd like to accept this FREE GIFT of salvation by Believing on Jesus finished work on the cross, pray this prayer and believe on Jesus.